In the User Demo sample, we create a new module called User and add all functionality related to user management and authentication to that module. If you are new to the concept of modules, refer to chapter Creating a New Module. The User module will have very few dependencies on other modules of the website. The idea behind the User module is to give you a reusable unit that you can use in your own web application, without any changes or with some modifications. Ideally, you will be able to use the User module in your own website without any changes. But, in real-life websites, you'll probably have to add some fields to the user table, modify the user creation workflow, or modify the access filtering algorithm. It this case, you'll have to customize the code of the User module to feet your needs. Let's briefly describe what classes we will have inside module's directory. The AuthController will implement user authentication functionality (login/logout). The User entity will be used to store information about the user in database (email, full name, password, etc). The LoginForm will be used to collect data for authentication (login and password). The PasswordChangeForm will be used to collect data for changing or resetting user's password. The PasswordResetForm will be used to collect the E-mail of the person who forgot his/her password and wishes to reset the password. The UserForm will be used to collect data about the user (email, full name, password, etc). The AuthAdapter service will implement the authentication algorithm. It will check if the user login (E-mail address) and password are correct. For performing that, it will retrieve the user information from a database. The AuthManager service will perform actual authentication (login/logout). It will also implement the access filter allowing or denying unauthenticated users access to certain web pages. The UserManager will contain business logic of managing users (adding, editing, changing password). Most controllers and services will be instantiated with factories. You can find the factory classes under the Factory subdirectories. Inside the view directory, we will have several view templates which will render HTML markup of the web pages present in the user interface exposed by our module. 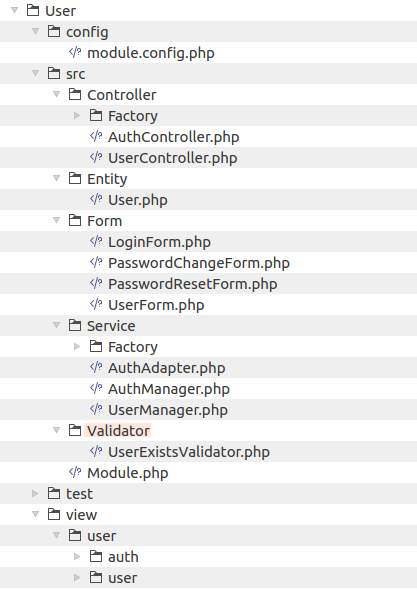 As usual, inside the config directory, we will have the module.config.php file that will contain routes and registration for our controllers and services. It will also contain the access_filter key defining which pages will be accessible to an unauthenticated user (this key will be read by AuthManager service). As you can see, the User module is a typical ZF3 module with the structure conforming to the MVC pattern.